Flex Your Media Buying Muscle! Today’s blog post comes from WebPT Media Buyer Lyndzie Phillips, Marketing Manager Mike Manheimer, and Copywriters Charlotte Bohnett and Erica Cohen. Woot! Team effort! In honor of this month’s marketing the PT profession theme, we thought we’d share with you our tips for flexing your media buying muscle—everyone has one, after all. Think of media as any channel you can use to get your message in front of your audience. So, when buying media, traditional will consist of print, tv, and radio slots as well as direct mail, whereas digital media will consists of online ad space as well as sponsored content. Whether you are an established clinic or brand spanking new, these tips can help you better understand the basics of advertising and how you can make it work for your clinic. 1. Analyze your audience...and competition. Where does your customer base live? What do they read? What do they participate in and enjoy doing? Before you decide what media spots to buy, look at who you want to reach and pay attention to their current behavior. Want to broaden your customer base and touch a new market? Read how Heidi found her niche by connecting with wilderness athletes. And while you’re learning about your audience, assess your competition. Are they advertising? If so, where? Use their placements for a quick, get-started list and then branch out with placements in media that’s similar or has a farther reach. Sponsor local community fundraising athletic events, like bike rides or 5K runs. You can even start your own event, like P.F. Chang did with their Rock n’ Roll Arizona Marathon. Advertise within fitness clubs; yoga and dance studies; or other athletic centers. You can also network with the instructors and trainers. Buy ad placements within local newspapers, newsletters, or magazines that has viewership coinciding with your target market. If you don’t have a website yet, create one. Nowadays, it’s a necessity. Get in touch with local websites, like community blogs, online newspapers, or organizations, that pertain to your audience. Buy banner ad spaces or sponsored email spots, or contribute a health and wellness article. Connect with Groupon, LivingSocial, or another online deal or couponing site, and create a special offer for your services. For the advanced internet user, consider Google adwords. 3. Negotiate for best placement and prices. First and foremost, make a media budget and stick to it. Now, it’s cliched but true: You’ll never know the answer unless you ask the question. So, ask for what you want—always. Want a better page placement? Want to knock a few hundred dollars off your fee? Ask! What’s the worst they can say? No? So why not go for it? You’ll be surprised how many times they actually say “yes.” Remember, though, that these media companies are in business to make money, too, so make sure what you ask for is fair for both parties. Will other ads rotate in the same space? 4. Hire a professional designer. Whether you’ve bought online or print ad spots or sponsorships, you’ll need an ad, and not just your logo thrown in MS Paint or Microsoft Word. You’re competing with everyone else on the page, on the website, or at the event. To ensure your ad stands out, consider hiring a professional designer. While you can always hire a publication’s in-house ad creation service, it’s usually more cost-effective to hire your own designer. Ask partners, fellow practitioners, friends, or family for recommendations. Nowadays, there is usually someone who knows a stellar graphic designer. If you can’t find a recommended one, research local graphic designers to compare work and rates. 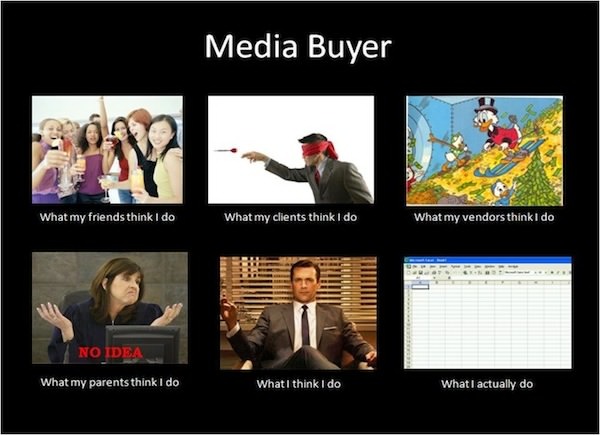 Hiring a professional might cost more upfront, but in the end, it’ll give you the most bang for your media buying buck. So you bought your ad space, hired a designer, and submitted your beautiful ads, flyers, banners, and the likes to the media source that was just right for your clinic. You’re done, right? No dice. Last step, though; we promise. Every ad dollar you spend is money wasted if it doesn’t drive traffic to your door. So track your media buys! When a new referral visits your clinic or makes an appointment, be sure to ask how they heard about you. You can also use unique phone numbers on each of your placements. Simply create unique numbers all linked to your real, original phone number for free through Google Voice. This way you can truly see how many calls your ad generated. To track online placements, follow up with your sales rep consistently for stats. You can also look into the analytics on your website and follow buzz about your clinic on social. For the advanced web user, consider setting up landing pages with unique URLs for each of your placements to monitor which ads are driving traffic to your website. Is your media-buying muscle all sorts of strong now? Lots of flexing and iron pumping, we know. But if you’re looking to truly expand your patient base, media buying should definitely be on your workout rotation. Already pretty buff (er, media savvy)? What tips, tricks, and best practices do you recommend? Share them in the comments below. Still looking to get your swell on? Ask us more Qs. At 1,169 words, we definitely have a lot to say, so ask away. You’ve learned all about marketing your clinic; now it’s time to talk about marketing the rehab therapy profession. In this webinar, we go far beyond business cards and email marketing. Here, we dive into ways you can influence how your patients, the public, and fellow medical professionals perceive the PT industry. This webinar was hosted by WebPT Co-Founder Heidi Jannenga PT, MPT, ATC/L and Marketing Manager Michael Manheimer.